Most teens don't know who Osama Bin Laden was, according to search engine giant Yahoo. This frightens me. 9/11 was only 10 years ago tomorrow, yet we seem to be neglecting to teach our children about that life-changing day. Perhaps this is because it was such a horrific event. How do we teach our children about it without shattering their innocence? Yet - one hopes - older kids and teens know about the holocaust, an at least equally horrific event in history. * September 11th coloring pages. More here. While your children color these, talk to them about the basic events of the day. * A free animated online movie about what happened on 9/11, and why. It's quite good - except it tries to convince viewers Islamic religious writings push peace, not violence. This is only mentioned once, however. * There are lots of YouTube videos of the events on 9/11. By all means, let your teens watch them. Here's a video montage that's more appropriate for grade school kids. 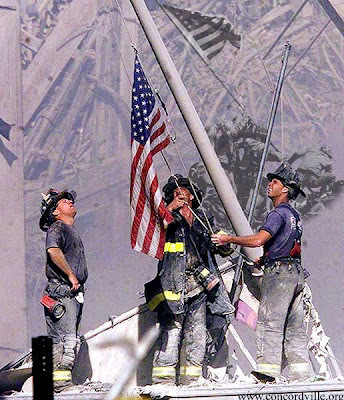 * Free 9/11 notebooking pages. * A time-line of the events on 9/11. Also, there's this interactive timeline, for older kids. * A kid-appropriate explanation of 9/11. * President Bush's 9/11 speech and Patriot Day Proclamation.